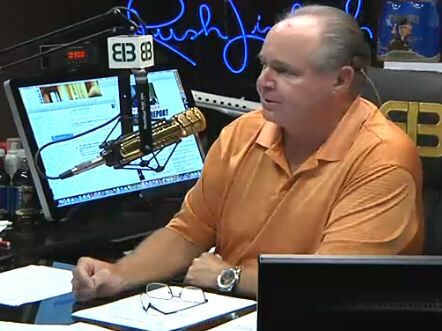 Rush Responds To Wolffe: Obama "Doesn't Respect The Country"
Rush Limbaugh responds to MSNBCer Richard Wolffe who said the opposition to President Obama giving a jobs speech on Wednesday, September 7th was based on the "color of his skin." "If they ever do a colonoscopy on Obama, they're going to find Richard Wolffe's head there." "We don't respect him because he doesn't respect the country. We don't respect him because he's trying to reverse centuries of greatness in this country." "I said yesterday, they would never ask Bush or Clinton any of these questions. Because Bush or Clinton would not have suggested a joint session on the night of either a Democratic or Republican debate, respectively. So there is your answer Mr. Wolffe, though I have more for you as the program unfolds." Carney: Timing Of GOP Debate And Obama Speech "Coincidental"